by Jane Nelsen, Ed.D., M.F.C.C., Lynn Lott, M.A., M.F.C.C., H Stephen Glenn, Ph.D. Very Good. Positive Discipline A-Z by etc., 1993-10-29. Trade paperback (US). Glued binding. 354 p. Positive Discipline Library. Good. 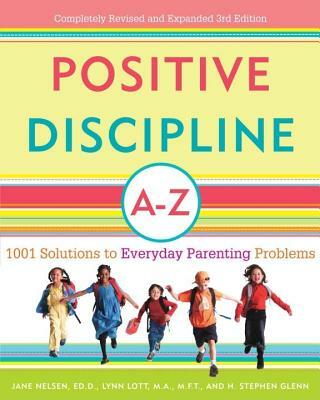 Positive Discipline A-Z by etc., 1993-10-29. Trade paperback (US). Glued binding. 354 p. Positive Discipline Library. Good. 1559583126 Ships from Tennessee, usually the same or next day. Good. [ No Hassle 30 Day Returns ][ Underlining/Highlighting: SOME ] [ Edition: Reprint ] Publisher: Prima Pub Date: 1/1/1993 Binding: Paperback Pages: 354. Books by Jane Nelsen, Ed.D., M.F.C.C. by H Stephen Glenn, Ph.D.